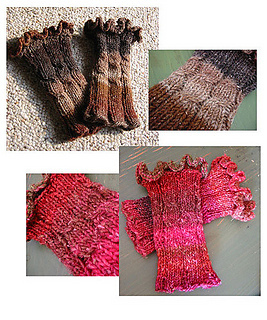 Knit in one skein of Plymouth Yarn Boku or one skein of Noro Silk Garden or 100 yds of any worsted weight yarn, these wrist warmers can be knit in the round or knit flat and seamed. They can be worn pulled up for warmth, or further down your arm for functionality. The cables give a snug fit on the wrist, and the ruffles enhance the earthiness of the yarn. This quick and easy knit makes a great gift—make a pair for everyone you know!